You apply a Layout Manager to a Panel or other container to control the position of its child components. The available layouts are Absolute, Border and Grid. When creating a Panel or container you are given the choice of Layout Manager in the New Panel wizard or New Container wizard. You can also select the container and click the Layout tool in the Panel Editor toolbar. Some containers have an explicit Layout Manager already assigned and in these cases the Layout tool is disabled. To achieve a responsive design with Absolute Layout, percentages can be used in Left, Top, Width, and Height values. The Property Editor also accepts percentages in combination with pixel values. For example, a component can be given a Top value of 50% minus one half of its width, to keep it in the vertical center of its parent container regardless of the containers size and shape. The Border layout will always stretch to fill its parent container; the Border layout will position components in the five defined regions of Top, Bottom, Center, Right and Left (Leading and Trailing are also defined for RTL language design). Visual hints are provided when dropping a component into a container with Border layout. Multiple components can be placed in the same region. The regions can be resizable at runtime by setting the Resizable property. The following values are only meaningful when the Resizable option is used: Define the limits for how small and how big with Minimum size and Maximum size as well as the initial size Width and Height. The top and bottom regions extend the entire width of the container and the remaining regions are placed in the middle. With the left and right (or leading and trailing) regions, the side regions take priority, extending the full height of the container. If the Gutters property is defined, the regions will have spacing between. The Live resize property will allow the regions to be resized at runtime. The number of columns is defined and the number of rows is then calculated as depending on the number of components added. 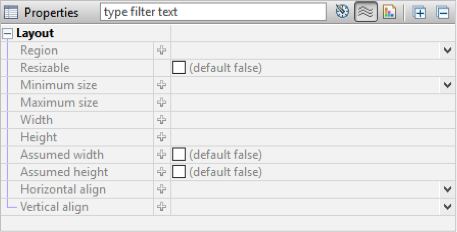 The ‘Same width’ and ‘Same height’ properties specify whether the columns and / or rows should be distributed evenly in the Grid. The ‘Cell spacing’ and ‘Cell padding’ can be defined and will then be applied for all cells in the Grid. The potential overflow of the Grid container’s content is determined by the Horizontal and Vertical align properties. When dragging a component over a Grid layout container, the container displays visual hints for positioning the component. 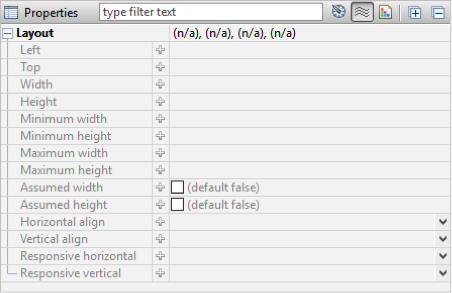 Depending on the settings mentioned above, the Grid will adapt to the new components, potentially adding rows and columns. 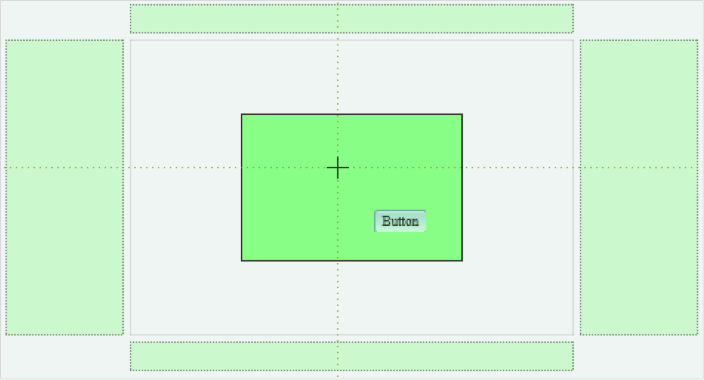 Another way to design the structure of the Grid is to use the Grid layout actions tool in the toolbar. If the container is not empty, the way in which the newly introduced components should relate to earlier components can be specified in the Distribute dropped components menu in the toolbar. 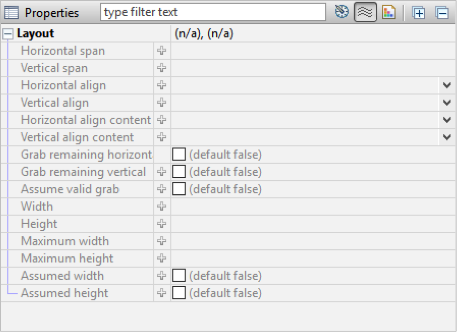 Component distribution options tool in the panel editor toolbar.